Today, I wanted to share with you a bit of eye candy from the book Mucha. This was a poster designed for the Brooklyn Exhibition 1912. The poster features a girl with Slav features. She holds a circlet of thorns as a symbol of the past and future of the Slavs. And for more eye-candy check out this video that features Traci Bunkers, author of The Art Journal Workshop: Break Through, Explore, and Make it Your Own, studio. The top 10 nutritional mistakes active people make. What do you do when the colors you've picked for your quilt are too bold or bright? When you cannot find that perfect pattern, sometimes you have to improvise. 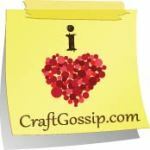 Happy St. Patrick's Day Week Crafty Links-Don't you feel Lucky? I do! And you're in LUCK, I've got some eye-candy and crafty links for you today! I love these new wall adhesives from Chocovenyl I saw over at Lilla Rogers' blog where you can also see a post with behind the scenes photos from her video shoot in her studio. Over at Where Women Create they have a call out for photos of your favorite objects in your studio. To celebrate National Crochet Month, Crafty Princess Diaries weblog has a stitch marker giveaway. Check out the tiny crochet carrots that Rorschach Amineko got! Looking for spring and Easter craft ideas? We've got lots of egg decorating ideas, plus a wall hanging, place cards, greeting cards, and some pretty special bunnies. Cyndi looks at different methods for adding delicate papers to your mixed media collage and quilting. Cherie makes some Peep bunnies for Easter out of felt. Another mixed media journal page by June. So now that Cyber Monday is just a memory I bet you can now turn your attention to decorating, crafting, and gift wrapping all the newly acquired purchases. Why not make some cute antique style embellished recycled gift tins? Check out this tutorial on recycled gift tin embellishing featured in the book The Art of Vintage Journaling and Collage: Techniques and Inspiration for Working with Antique Ephemera. Click on this page from The Art of Vintage Journaling and Collage: Techniques and Inspiration for Working with Antique Ephemera to enlarge and read all the details on how to make antique style recycled gift tins. Maryjo Koch is a popular and highly regarded naturalist painter and collage artist who has authored and illustrated over a dozen books including the best-selling Bird Egg Feather Nest. She began teaching nature painting at both the California Academy of Sciences and the Monterey Bay Aquarium, and now conducts painting and collage workshops at her studio near Santa Cruz, California. Her work has been exhibited in natural history museums nationwide, and her paintings and prints are sold in galleries and specialty shops throughout the United States and Japan. Maryjo's artwork has been featured on fine housewares products and on gifts and stationary by retailers such as Chronicle Books, Marcel Schurman Fine Papers, Smith & Hawken, and The Republic of Tea, and The Nature Company. Sunny Koch has shown her work in Santa Cruz Open Studio, offers collage classes a few times a year, and illustrates for magazine articles, annual reports, advertising, and event invitations. Sunny was awarded for an editorial illustration entitled Discovering My Roots, by both American Illustration 21 and Blue Cube Arts. She has been featured in Somerset Studio magazine. To see their work, visit www.kochstudios.com.